This weekend we drove out to Wasilla – yes, that Wasilla. No, we didn’t see Sarah or any of the Palin bunch. We drove out to attend the Mat-Su Valley Outdoorsman Show. We wanted to get some ideas for fun things to do with the kids this summer. Todd also wanted to get more information on the hunting and fishing available in the area. We let the kids climb in a bunch of campers. We sampled cupcakes from a woman that has a mobile bakery – delish! Todd subscribed to the Alaska Fishing magazine. Just generally looked around. 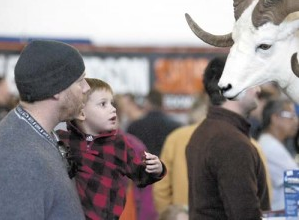 Todd and Jack check out the Dall sheep mount at the Mat Su Outdoorsman show. On another note, I’d appreciate it if you kept my little guy, in your thoughts and prayers. We found out on Sunday that Jack has pneumonia. He’s currently on antibiotics and doing breathing treatments and seems to be on the mend. It hasn’t been a fun few days though.